Tagging in Legacy helps me keep track of projects and direct line ancestors. There are advanced tagging options for individuals and marriages. In the image above on Joseph Thomas you can see that he is tagged on #1, #4 and #9 and in the marriage section there are not tags. The image below shows what the advanced tagging window looks like. If you right click on the tags (see above image) the Advanced Tagging window will open. In the Legacy Virtual Users Group (LVUG) on Google+ we were going to talk about data entry for our veterans in our month LVUG meeting but internet problems prevented us from having our meeting so I decided to post my data entry here. While researching Joseph I added whatever I could find about his time in the Civil War to Evernote. From this information I was able to put the timeline (shown in image below) together to help me understand my information better and I was able to add a lot of information to Legacy. The timeline was created in OneNote (shhh...don't tell) and the cells in the table are able to be edited. Below you can see Joseph's family in the Family view in Legacy. In the image below is Joseph's Individual Information screen. A quick thank you to Cousin Russ, at Family Tree Maker User, for all the great tips on adding the shaky leaves to our tree and to Randy Seaver, at Genea-Musings, for his great tips on searching a specific database for hints in your family tree. 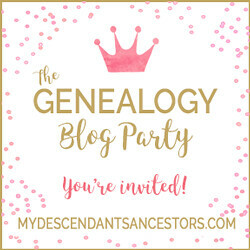 We have a great genealogy community/family who is willing to share! Before, I would go person by person adding hints and I felt like I was getting no where. Using Randy and Russ' search techniques I have been able to go through all of my Pennsylvania Death Certificates and add them all to my database and currently I am working on the Social Security Death Index. When I am extracting information from Ancestry.com to my database I like it all to be done in a uniform way. To keep things easy I made a note in Evernote to use as a template.